Many home gardeners produce excellent vegetable harvests in Montana, even though the growing season is relatively short in some parts of this northern state. The Continental Divide splits the milder western part of Montana from the cooler climate of the east. USDA plant hardiness zones range from 3a in the northeast to 5b in the far west. The average number of frost-free days varies widely across the state. In Butte, the growing season is normally just 80 days due to the elevation, while toward the eastern border it averages 150 days. Select a level, well-drained location that gets at least six hours of sunlight a day. If this your first vegetable garden, start small and expand it in future years as you learn more. Place wooden stakes at the corners of the plot as markers. Dig out any turf or other plants to get down to bare soil. Turf can be chopped up and used as compost. Turn the top 4 to 6 inches of soil with the spade. Spread at least 4 inches of aged compost or manure over the entire plot and leave for three to four days to work into the soil. Plan your garden by drawing an outline of the plot. Add rows to your diagram and label where each type of vegetable will go. Small varieties like onions, carrots and beets can be grown in rows 18 to 24 inches apart. Orient the rows north-south to maximize exposure to sunlight. Keep taller vegetables such as pole beans on the north side where they won’t overshadow the rest. Refer to the vegetable planting guide published by the Montana State University Extension Service for detailed information on row spacing and planting instructions. Remove the corner stakes and level the plot with the rake. Mark out the rows according to your drawing using stakes and string. Use the hoe to make a 6-inch-tall mound of soil along the length of each row. Plant your seeds at the correct spacing and depth, referring to either the guide or the directions on the seed packets. Cool-season vegetables such as lettuce, onions and asparagus can be planted as soon as the risk of frost has passed. Spray the garden with a fine mist of water to keep the seeds and soil moist. Water your garden early in the day. Direct the water to the soil rather than spraying the foliage of the plants. Wet leaves can encourage both insects and disease. Use soaker hoses stretched out between the rows if available. Vegetable gardens need at least an inch of water per week. Precipitation is easily measured by placing several empty coffee tins around the garden. Measure the depth of water in the tins after each rainfall and keep a record of this information for future reference. Weed your garden daily, if possible. Weeds are vigorous competitors for soil nutrients and can seriously affect the growth of the vegetables. 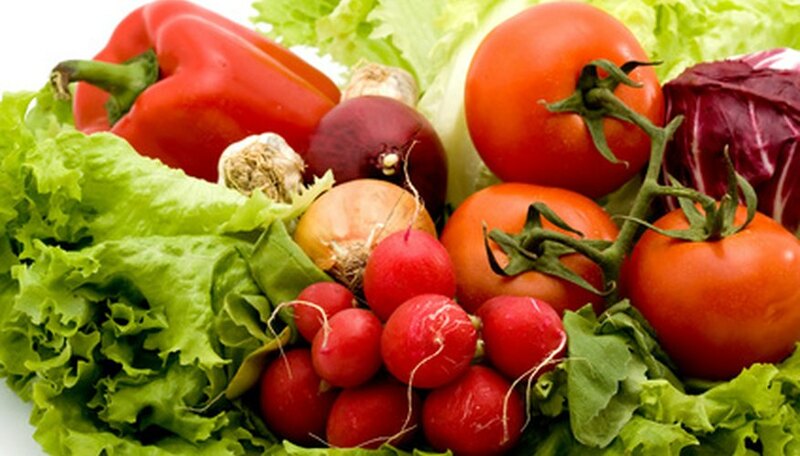 Check the foliage of the vegetables regularly for signs of damage caused by insects or disease.